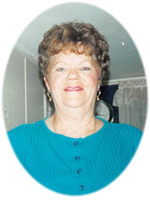 Madeline McIntosh Obituary - Newport, Arkansas | Jackson's Funeral Homes Inc.
"Prayers and Love to you my friend Brian"
Mrs. Madeline Barbara (Huskey) McIntosh of Newport, Arkansas departed this life on Saturday, December 2, 2017 at the age of 82. She was born May 20, 1935 at Saffel, Missouri, the daughter of Lonzo and Rosie (Hanley) Huskey. Mrs. McIntosh was a homemaker, and a member of Jacksonport Baptist Church. She enjoyed looking for arrowheads, and hunting and fishing with Gene. Mrs. McIntosh was a wonderful cook, and enjoyed gardening. She was preceded in death by her husband of 20 years, Eugene “Gene” McIntosh; two brothers, Danny Huskey and Bill Huskey; three sisters, Virgie Sullivan, Evelyn Miller, and Carol Fortenberry; two grandsons, Chris Smith and Steven Smith; and her parents. Mrs. McIntosh is survived by two sons, Steven Smith and wife, Vickie of Swifton, and Brian McIntosh and wife, Donna of Grubbs; two daughters, Barbara Dodd of Swifton, and Angela Farmer of Bradford; two brothers, Phillip Huskey and wife, Mary of Tuckerman and Johnny Huskey and wife, Charlotte of Ravenden; two sisters, Earline Eickhorst and husband, Floyd of Jefferson City, Missouri, and Sharon Sales of Swifton; eight grandchildren, Shelly Simmons, Holly Smart, Jarrod Farmer, Erica McIntosh, Whitney McIntosh, Heather Roberts, Shane Reeves, and Tommy Bishop; and several nieces and nephews. Friends may visit at the funeral home, Thursday, 12:30-1:30. Graveside services will follow at 2:00 p.m. Thursday, at Swifton Cemetery with Bro. Jay Cox officiating. Those honored to serve as pallbearers are Jarrod Farmer, Cody Mann, Jerrod Simmons, Tim Nicholson, Shane Reeves, and John Washington. Honorary pallbearers are Shawn Russell, Jimmy Darling, and Ricky Baker.